This past month has seen much debate about the rising prices of utilities in the UK, focussing on gas and electricity. The price hikes have come not long after reports that companies have made massive increases in profits, for example Scottish Power more than doubled its pre-tax profit to £712m in the year that it raised gas and electricity prices by 7%. This is important, not least because over 3 million people were in fuel poverty in 2011 [see tables here]). David Cameron says that the reason behind rising prices is the introduction of green levies. But when set against this background of fuel poverty means that people are being forced to choose not only between eating and heating, but also between eating and the hope for a habitable climate. I mention all of this to substantiate the claim that the politics of energy often include important considerations of cost and climate change, amongst other issues (for example, energy security) and the balance between the two, but also to highlight the impact of rising utility prices on poverty in the UK. Questions about rising prices in the water industry often play out according to the same issues of climate change and poverty. But things have been relatively quiet of late for the water companies, which might, in part, be that the average cost of water per household is relatively small compared to gas and electricity, costing £388 compared to £1279 [1 + 2]. Nonetheless, water poverty is a very significant problem in the UK. In the period 2009-10, nearly a quarter (23.6%) of households were in water poverty (requiring that they spend more than 3% of their income on water). 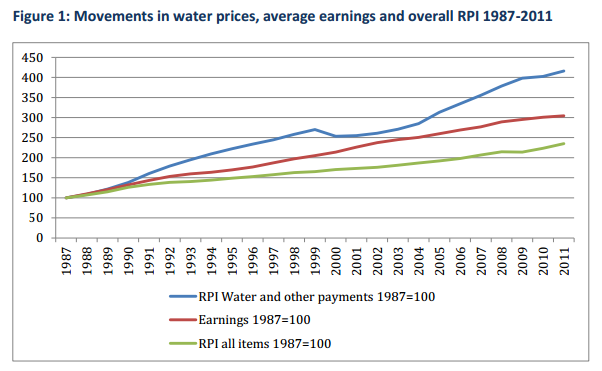 Prices have consistently risen since privatisation of the water industry in 1989, and have increased faster than overall prices in the UK and faster than average earnings. This is partly because of increasing costs of water provision and treatment, which is caused by a range of factors including climate change (flooding and drought), water practices (consumer and corporate ‘over-use’ and waste) and infrastructural problems (ageing of pipes and leakage in distribution). One key dimension to the increasing price of water is thus the costs of investing in innovations to help to tackle the effects of and reduce our contribution to climate change, and to fix the maze of Victorian pipes that are leaking under out feet. In a recently published paper, Susan Molyneux-Hodgson (University of Sheffield) and I, presented findings from two years of research on the way in which a group of academic researchers tried to produce a bold technical innovation in the water industry. As part of that work we explored how academic researchers and industry actors worked together and how these groups explained the lack of funding for adventurous innovations. We identified a recurring story about the UK’s impregnable ‘innovation barrier’ for developing cutting-edge technologies, for which there is very limited funding since much of the available money from the UK research councils and from the companies themselves goes instead towards producing incremental improvements in existing techniques. In our interviews with academics and industrial actors we found that the major narrative explaining the lack of industrial investment was that consumers were ignorant of the costs and ‘true value’ of water and were unwilling to pay the real cost of managing the network and developing novel technologies to help alleviate the problems of climate change and the ageing of the infrastructure. They blamed consumers for their influence on regulators, who seem to be unwilling to let the companies charge more. Many academic colleagues in natural sciences and engineering bought into the idea that the problem wasn’t so much with monopolies profiting massively from essential water services – whilst the infrastructure aged and climate change got worse – but with consumers, who just couldn’t accept how much it would cost for problems to be fixed. Ultimately, then, the construction of the problem framed its own solution: actors wanted to educate the consumer about the value of water so that they will be willing to pay more for research and innovation, which they believe will help solve leakage and climate change problems. But we would be rightly sceptical to think that higher prices for water would be used to invest heavily in research to fix problems and lower consumer bills because industrial priorities are not skewed towards investment in infrastructure and technical solutions. For example, across the UK market, investment in research and development varies from a piddling 0.02% of turnover up to the disappointingly tiny drop in ocean at 0.66%. In our interviews with industrial actors we found that they saw no clear incentive to invest in bold technological programmes of innovation if there wasn’t a clear profit to come from it. Of course, the investment in technologies that might help to protect us against the increasing severity of floods and storms, shortages and droughts, and to help reduce the impact we are having on the global environment are not easily turned into short-term profit making ventures. But clearly, the cost to our water infrastructure, service provision and treatment would be astronomical if we allowed climate change to escalate and the infrastructure to crumble. Technologies are not the only thing we need to help alleviate these problems – we also have to look at consumer and corporate practices. But technological innovation is important. The costs of innovation are not too high, they are essential, but the companies still aren’t willing to pay. Just like David Cameron wants to focus on green levies in tackling rising fuel bills, trying to educate consumers so that they see the true value of water and thus are willing to pay more is one way of trying to protect profits for shareholders at the expense of often impoverished people in the UK. Regulators of the utilities and our politicians have to be brave and challenge the industries to ensure that profits are not put ahead of the protection of fuel and water poor people in our country or at the expense of our climate and future survival.